The highlight of our time in Tokyo were the private studio, showroom and home visits that took us to new parts of the city we wouldn't have discovered as regular tourists and introduced us to designers, artisans and business owners working in the field of textile design. 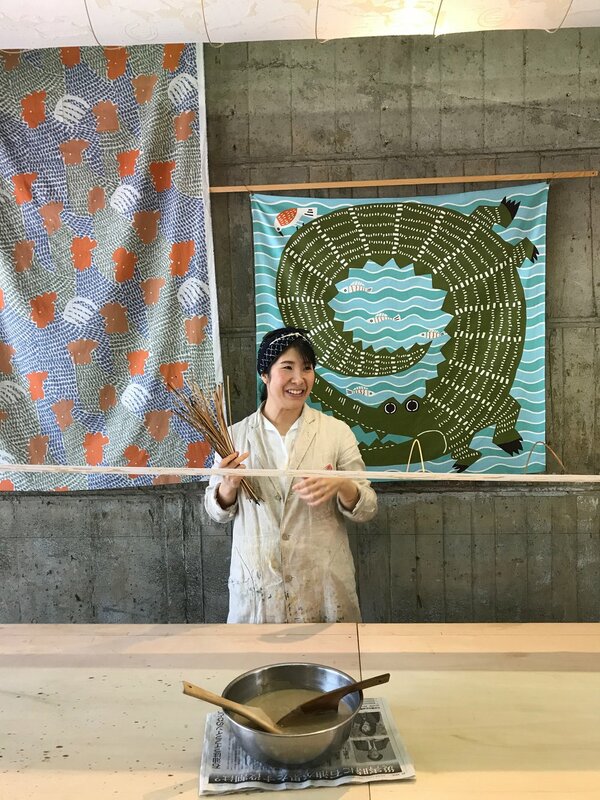 We enjoyed afternoon tea at the home of a young entrepreneur who is redefining the traditional furoshiki wrapping cloth by collaborating with contemporary artists for her line of furoshiki, which are screen-printed just outside Tokyo. We were delighted to visit charismatic Reiko Sudo, the head of renowned textile brand NUNO, who described the innovative textile design techniques that her company has pioneered. 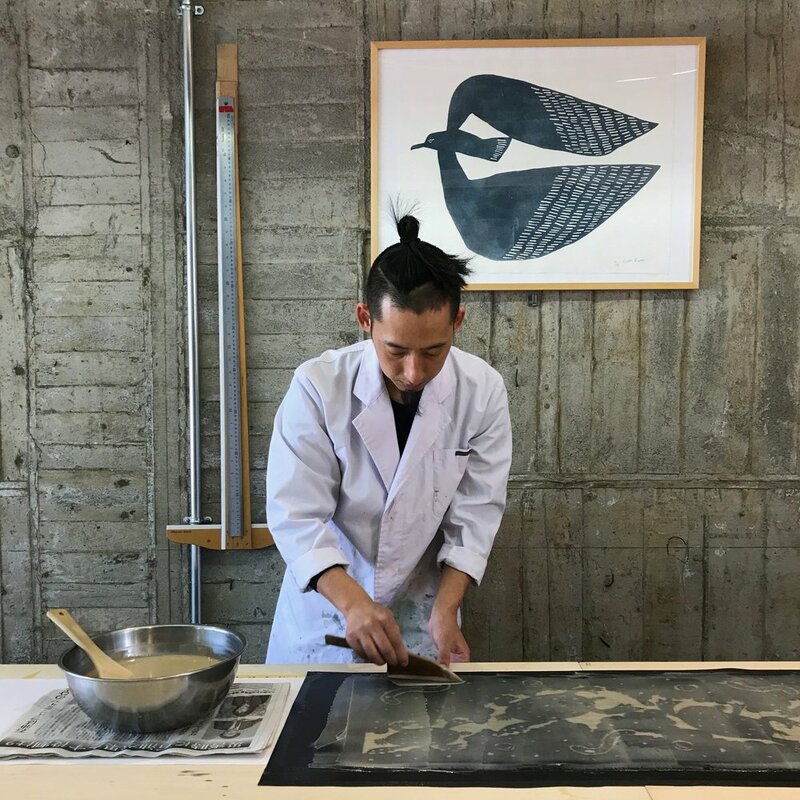 We were warmly welcomed to the studio of a charming couple who create bold, whimsical katazome designs under their own independent label and we visited the atelier of one of Japan's few contemporary kimono designers. We toured the workshops of two century-old, family-run businesses: one of which dyes kimono fabric for Tokyo's department stores using traditional methods and the other a light-making company, which makes elegant paper and bamboo lights. Both visits included demonstrations and hands-on workshops. We also enjoyed shopping at each of our private visits. Exploring Tokyo by train and foot, we traversed many neighborhoods and got a feel for this dynamic city, with its teeming commercial districts, which coexist alongside quiet residential neighborhoods. Our hotel was located in Jingumae, a neighborhood situated between lush Yoyogi Park and frenetic Shibuya, with many shops and restaurants nearby. Eating out is one of Tokyo's greatest pleasures and we enjoyed everything from an elegant, multi-course modern kaiseki dinner to delicious take-out from the bustling depatchika (department store food court) near our hotel. Cultural sights included an architectural walking tour; enjoying the galleries and verdant gardens at the Nezu Museum; visiting the wonderful Folk Crafts Museum; and an evening walking tour through one of Tokyo's oldest nightlife districts. We attended the re-opening party for Tokyo's beloved Blue & White store and also enjoyed shopping for contemporary and traditional Japanese design at some of the city's best stores. In contrast to Tokyo, the second half of our trip took place in a small, lush mountain village where we stayed in an old silk-farming house surrounded by steep tea fields. Our retreat took place over Children's Day and we were delighted to see the traditional carp flags flying over the village. 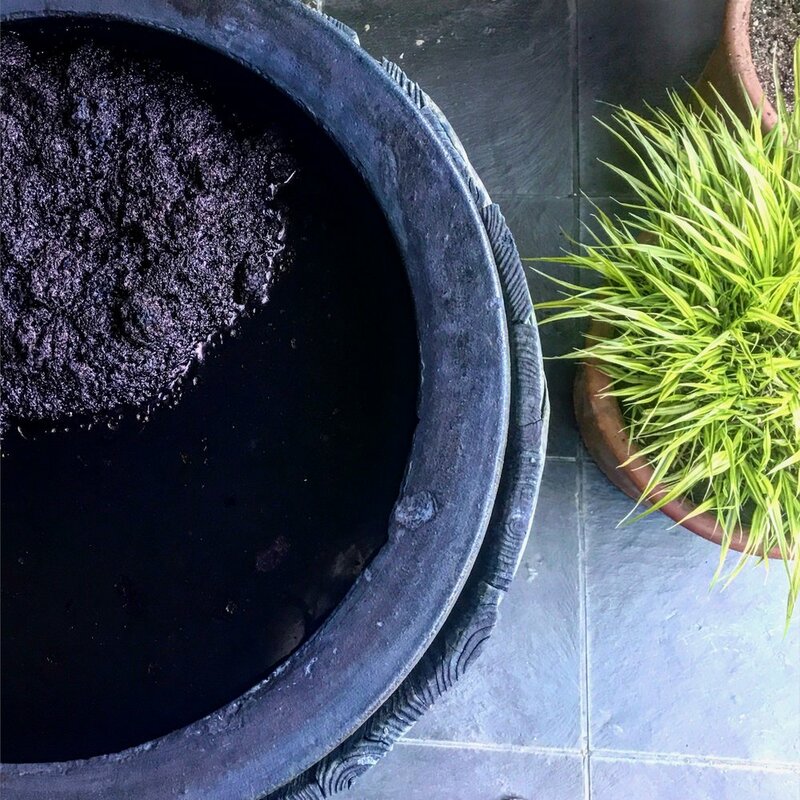 We learned the art of indigo dyeing with our host, Bryan, a life-long student of Japanese crafts and culture. He gave us an intensive introduction to nui (stitched) shibori and each person in the group created a magnificent mokume, or woodgrain, shawl. 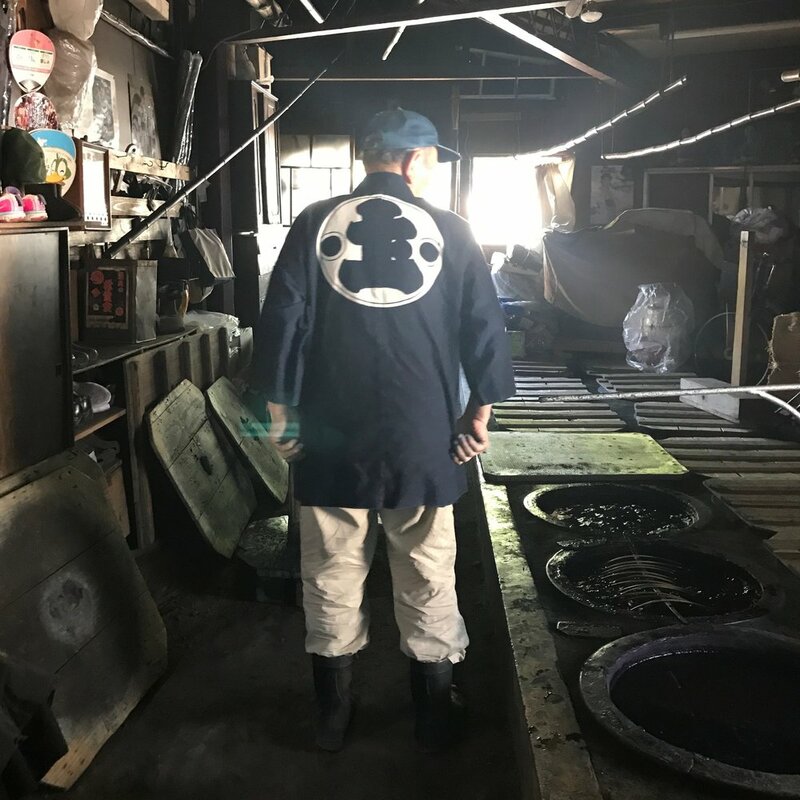 We learned the basics of katazome stencil dyeing and were privileged to visit a 6th-generation katazome dyer, who dyes indigo prints for cotton yukata. We dyed fabric with our own katazome stencil designs at his workshop and enjoyed looking through his archive of old stencils dating back to the late 1800s. Other experiences included visiting a local potter and a hands-on introduction to ikebana.